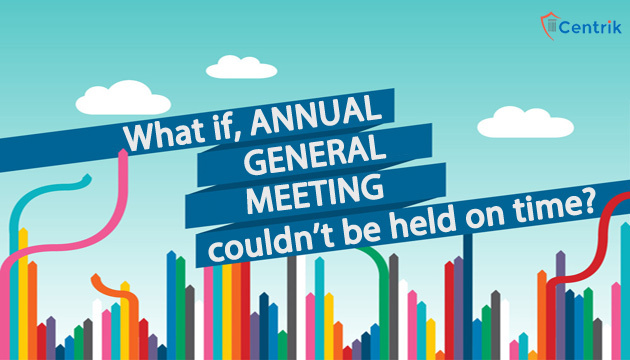 What if, Annual General Meeting couldn’t be held on time? CentrikBlogsBusiness AdvisoryRegistration And ComplianceWhat if, Annual General Meeting couldn’t be held on time? Provided that in case of the first annual general meeting, it shall be held within a period of nine months from the date of closing of the first financial year of the company and in any other case, within a period of six months from the date of closing of the financial year. In any other case, if Annual General Meeting couldn’t be held within the stipulated time frame, for the special reason, Registrar of companies may provide an extension for a period not exceeding three months. This extension must be applied before the last mandatory date for holding AGM. Now, what if AGM couldn’t be held within prescribed time period and company hasn’t applied for an extension as well? According to section 97 of Companies Act, 2013, if any default is made in holding the AGM of a company U/S 96, The Tribunal may, notwithstanding anything contained in this Act or Articles of Association of company, on the application of any member of company may call or direct the company to call Annual General Meeting of the company. And as per section 97(2) of Companies Act, 2013, the general meeting held in pursuance of Section 97(1) will be deemed as annual General meeting of the company. Hence, with the help of section 97, if any company fails to call AGM and didn’t apply for an extension as well, it can call AGM with help of any member who can file the application to NCLT with Form NCLT-1. In case of any default in complying with provisions of Section 96 and section 97 or failed in complying with any directions of Tribunal, the Company and every officer of the company who is in default shall be punishable with fine which may extend to one lakh rupees and in case of continuing default, with a further fine which may extend to five thousand rupees for every day during which such default continues. The company is not bared for holding AGM beyond prescribed time period, but it will subject to certain penalties as mentioned under section 99 of Companies Act, 2013. If AGM couldn’t be held on time, neither extension was sought, Company may go to NCLT/RD under compounding of offenses.